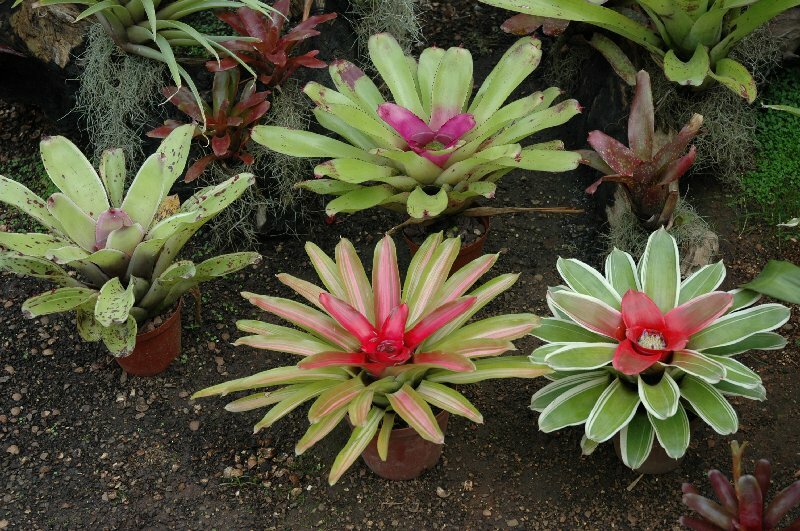 BROMELIADS are native to Central and South America. The family consists of over 2000 species, and more are still being discovered. The diversity of Bromeliads ranges from the pineapple to the “Spanish Moss” or “Old man’s beard” we have all seen in pictures of the Florida everglades, hanging in the trees. Countless hybrids have been produced from these species and the possibilities are endless. Bromeliads are hardy, easy to grow and survive the neglect imposed upon them by the accelerated pace of modern living. Greatly adaptable, they grow under artificial, air conditioned atmospheres and tolerate abnormal light and moisture situations. They are ideal companion plants to most orchids as they both favour the same conditions for growing ..
Aechmeas could be described as stately in size and form. Their leaves are often strongly patterned, with flower bracts that usually produce berries that last for months. Some are quite hardy and will take full sun although others require semi-shade to full shade. Sizes vary from quite small to huge. Although their flower is not long lasting, it is orchid-like and quite beautiful. The plants are mainly tubular in shape and are very decorative and worthwhile. They prefer good light. Cryptanthus collecting is fast becoming recognised as a hobby in itself, particularly where space is limited, and a very rewarding hobby at that. These colourful and fascinating little plants, commonly called “earth stars”, are the one of the few genera of true terrestrials in the Bromeliad family (apart from Orthophytums and similar plants). Grow them indoors or out. The light level is important to their colour development; too much and they will bleach and too little and they go dark. Possibly some of the most beautiful Bromeliads are the Guzmanias. With often beautifully coloured and patterned leaves and long lasting flower bracts, sometimes many months, they make ideal indoor plants. They often have delicate foliage and should be grown in a sheltered, semi-shaded position. Of all the Bromeliad genera, Neo’s as a whole are the most colourful. They do not have a significant flower but are in demand more for their brilliantly coloured leaves. Their form is generally rosette and their size varies from about 10cm. to a metre or more. Neo’s need bright light to colour well but may burn in full sun. Nidulariums are probably the most under-used of all the Bromeliad genera. They make excellent indoor plants or can add spectacular and long-lasting colour and contrast to a garden. In looks, they are almost a combination of Neos and Guzmanias having mainly green to purple leaves and a coloured central flower rosette. They look their best in semi-shade. Tillandsias are the most fascinating of all the Bromeliads. They are completely ephiphytic (air growing) and will grow almost anywhere. Under normal garden conditions they will grow without additional watering or feeding although these will encourage extra growth. 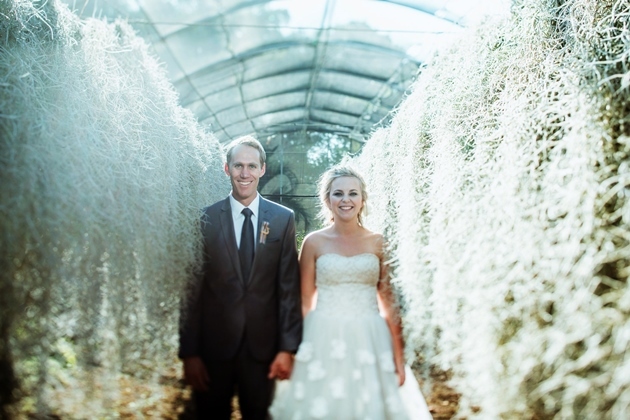 They vary greatly in growth and flowering habit and so are difficult to describe. Some are large, some small. some grey, some fuzzy, others smooth and some have beautifully perfumed flowers – they are all beautiful. They can be glued with most glues (NOT SILICONE ) or tied to most rough surfaces until the roots take hold. Vrieseas are a worthwhile addition to any garden or greenhouse as well as being an ideal indoor plant. Some vrieseas have magnificent leaf colour and marking, whereas othere may be more plain with soft green or purple leaves but they usually make up by bearing a striking sword like flower bracts which lasts for months. They prefer shady conditions. POTTING Most Bromeliads, except for a few terrestrials, are either epiphytic or semi-epiphytic and can be tree mounted or potted. A Cymbidium orchid mix is most commonly recommended but they seem to do well in any medium provided it is very open and drains well. Pine barks are the basis for most mixes. The terrestrials (especially Cryptanthus) prefer a heavier mix e.g. a fern type mix, which will remain moist. Most Tillandsias need to be mounted on wood, rock, etc. but there are a few varieties that will do better if potted in a free draining open mix. WATERING Normal garden watering is fine. So long as their cups contain some water they will survive. Whether this is from weekly or more frequent watering or from normal rainfall does not really matter. It is nearly impossible to over water as the cups will simply overflow. 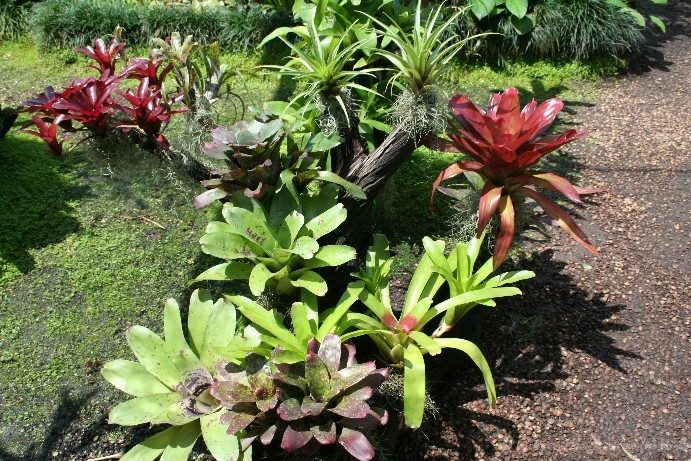 FERTILISING Bromeliads require very little fertilising. Some varieties are able to take more feeding than others but over fertilising plants such as Neoregelias will result in long strappy leaves (compact shape is usually better) and loss of colour. A pinch of slow release fertiliser when first potting these plants is usually sufficient. Genera such as Cryptanthus and Vrieseas require more feeding. PESTS Probably the only pests you will have to worry about with your Broms are various types of scale, the worst of which is “fly speck scale” which can be seen as small black spots over the leaves. These scales can be controlled with insecticides specifically for scale pests. Scales will not be as much of a problem in plants which are given good light and air movement and where periodic inspection and maintenance is carried out. NEVER USE WHITE OIL SPRAYS. PROPAGATION ……is usually by the removal of offsets which are often called “pups” which can be cut or broken from the mother plant when they are approximately one third to half the size of the mother which will often then produce more pups before deteriorating and dying over a period of months of even a year or so. Pups can be stood together on top of or slightly into potting mix in a box until they root and then they can be potted. LIGHT It is important to find the right spot for the right Brom as the conditions required to get the best results vary from variety to variety. One of the major factors in this is light levels. 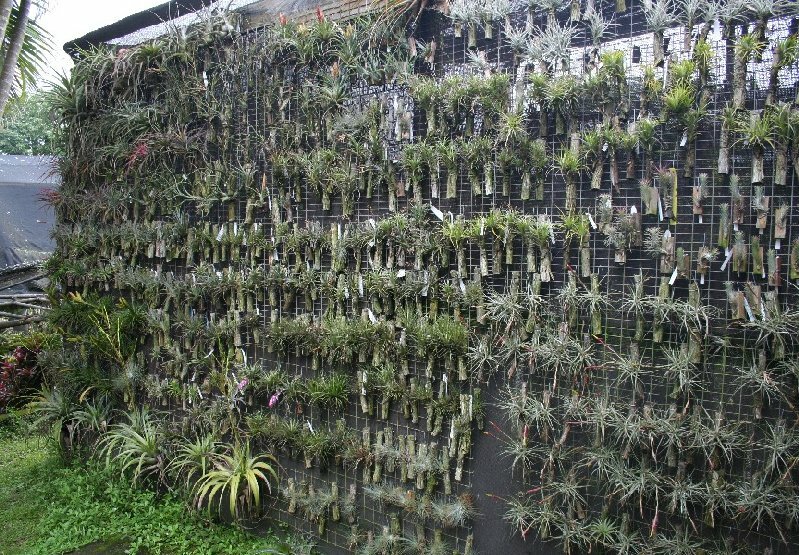 Plants such as Neos, Ananas, Tillandsias, etc. require good light whereas Vrieseas, Guzmanias, Canistrums and Nidulariums will look good grown in shady areas. Most plants will adapt well to 50% or 70% shade cloth under which there are usually areas that are more shady or more light. It is usually better to keep your plants in pots and move them around until you find a position where you feel they respond best. Cryptanthus require semi -shade to look their best. TILLANDSIA – Tillandsias are the most fascinating and certainly the most peculiar of all the Bromeliads. Highly variable, they may be bulbous, tufted, grass-like, or assume several other curious forms. Typically, they are plants of the air, dwelling in its treetop environment where the winds move freely. They require little care if given a suitable environment – bright light to full sunlight, good air circulation and moist atmosphere. Most require seven years or longer to grow to flowering from seed. TILLANDSIAS are probably the most fascinating genus of the Bromeliad family. There are now over 500 species and new varieties are still being discovered. Hybrids are also becoming more common. 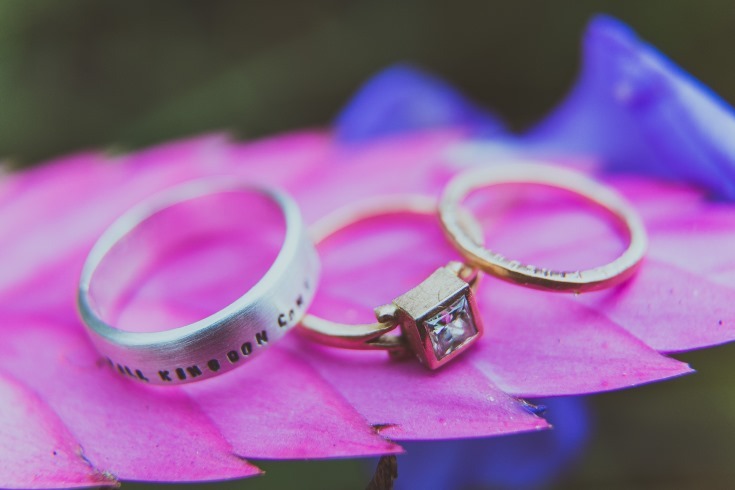 In nature they range from Florida and Mexico through all of the Central and South American countries, from deserts to rainforests, from freezing to tropical conditions. They vary in size from 1 cm or so to plants in excess of 4 m. Habitat altitude ranges from sea level to elevations of 3000 m. Most Tillandsias are totally epiphytic or “air growing” and are able to extract all moisture and nutrient required to live through a system of trichomes or “fine hairs” on their leaves which gives many of them a silver/grey velvety look. As a general rule, the more silvery they look, the dryer the climate of their native habitat. This silvery surface also reflects heat and keeps the plant cooler in the hot desert areas. The forest dwellers tend to be green or red. Tillandsias vary greatly in size, shape, leaf formation, colour combinations and general adaptability in their native habitat. Some have the most beautiful perfumes. Some have dispensed with a root system and use their leaves to hold onto branches so they do not fall to the forest floor where they might rot away. However, most do have relatively small root systems which attach the plants to various mounting materials such as cacti, bark or branches, rock, sand or leaf litter on the forest floor. They do not use their roots to feed and are not parasites. These plants are very slow growing so patience is required. Single plants can be very attractive but they are at their best when they have formed into larger clumps or colonies. Clumps in flower can be quite spectacular. After flowering, mother plants will make new plants in the form of suckers called “pups” or “offsets”. Remember that growth of a clump is slowest in the early stages. 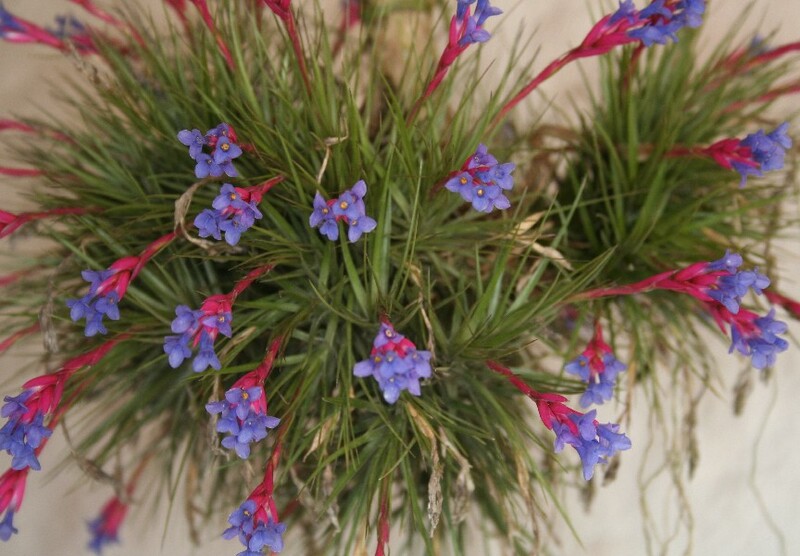 GROWING CONDITIONS Tillandsias require light, water, and good air movement to grow well. If these requirements are provided, they can be grown in many and varied situations from open gardens to indoors, but I recommend outdoor growing and taking the plants indoors for short periods. Let’s look at these one by one. LIGHT As a rule, the silver/grey varieties will tolerate full sun whereas the green plants will require some shade. Most of my plants grow well under 50% shade cloth with the more shade loving plants placed in the shadier positions. Some people use 70% shade cloth with good results but my philosophy is “you can always add shade but it’s difficult to add light”. Plants indoors will do better in a well lit area than a dark corner. WATER Watering requirements will vary according to individual situations, i.e. indoor or outdoor growing, winter or summer, humidity etc. I believe in under watering rather than over watering because plants can be damaged by over watering whereas they will normally show signs of under watering before damage is done. My plants get a reasonable watering once or twice a week summer and winter and I find this adequate. If plants are not receiving enough water they will show signs of dehydration or dryness. Tillandsias – bergeri and aeranthos are good indicators as they usually let you know first by the leaves pinching into a trough shape. In very severe cases of dehydration, plants can be soaked in a bucket of water for several hours without harming them. Indoor plants may need regular misting with an atomiser (maybe once a day) as the atmosphere inside tends to be dryer particularly if air-conditioned. A thorough watering or soaking once a week is also a good idea. Although regular watering is desirable, plants will not usually come to any harm if unattended for several weeks or even longer. AIR MOVEMENT These plants respond to a nice breezy situation. MOUNTING Tillandsias can be mounted on a number of different materials. Cork, timber, driftwood (soak well to remove any salt), grape wood are the most successful. Rock, unglazed pottery, shells, etc. can also be used but the plants are not usually as happy on these surfaces. Generally accepted methods of fixing include gluing or tying to hold the plant in position until the roots take. I use hot glue from a glue gun but most other glues (EXCEPT SILICONE) are used. Contact glues are quite good if you smear some glue on the mount and some on the plant, allow to dry for a few minutes and press the plant in position. I mount most plants facing downward as I find that most of them will turn up towards the light and if the glue lets go after the roots have taken, the plant will hang like a hook instead of falling away from the mount. Never allow copper or zinc to come into contact with the plants as it may harm or kill them. I find that some varieties do better if potted or at least mounted in an upright position. Some of these would be cyanea, lindenii, most of the fasciculata types, flabellata and most of the green Vriesea types. Pot in a well drained open mix. FERTILIZING Some people apply foliar fertilizer to their plants, some once a week, others once a month but I find that it does not make much difference. If you wish to fertilize, use a fertilizer such as Phostrogen as Tillandsias need their nitrogen in ammonia form, not urea form. Use foliar fertilizers at half the recommended strength. FLOWERING Pups will normally flower within a year from purchase. Seedling plants may take substantially longer, sometimes many years. Sometimes individual plants can skip a year but once a clump is established, you should have a reliable flowering each year. Each variety has its’ own flowering season, so, with a reasonable collection of Tillandsias, you will have something flowering all year. Flowers can last from a few days to many months, depending on the variety. If you have one that should have flowered but doesn’t want to, moving the plant or placing it in a bag with an apple may produce -results. There are about 20 or 30 varieties that are beautifully perfumed. I trust this information has given you a little more understanding of these marvellous plants so that you may receive more pleasure from them. Our Pinterest Boards – Fall in love with the Tillandsia and some of the other fascinating members of the Bromeliaceae.